• In green chain 27, the 27th is the turning stitch. • Crochet a single stitch in each chain, so that you have 26 single stitches, turn. • Crochet a second row of green single sts, then two rows of white single sts, retaining 26 sts on each row by using a turning st on each row. • In green chain 17 , the 17th is the turning stitch. • Crochet a single stitch in each chain, so that you have 16 single stitches, turn. • Crochet a second row of green single sts, then two rows of white single sts, retaining 16 sts on each row by using a turning st on each row. • Sew each leg around a pipe cleaner, lengthwise, using blanket stitch and yarn needle, with some of the white cotton yarn. Leave one end open and sew the other neatly shut. • In green, do a magic circle with 8 single crochet sts, seal with a slip st.
• Row 1: Chain 1 and single crochet in the next 5 sts, chain 1 and turn. • Row 2: Crochet 2 single sts in the first st, then 1 single crochet in the second, 2 singles in the third, 1 single in the fourth, and 2 singles in the fifth. Chain 1 and turn. • Row 3: Crochet 1 single st in the first st, 2 in the second, 1 in the third, 2 in the fourth, 2 in the fifth, 1 in the sixth, 2 in the seventh, and 1 in the eighth. Chain 1 and turn. • Row 4: Crochet 1 in the first, 2 in the second, 1 in sts 3 – 10, 2 in the eleventh, and 1 in the twelfth. Chain 1 and turn. • Row 5: Crochet 1 in each st.
• Single crochet around the edges of the head to create a neat edge. • Chain 12 sts and join st 12 to 1 with a slip st. Sew around the eye and repeat for the other eye. • In white chain 9, the 9th st is the turning st.
• Crochet 11 rows of single st, retaining 8 on each row by using a turning st on each row. • Without using a turning st, crochet a further 5 rows, allowing the body to gradually taper. • (the frog’s underbody should be 16 rows long, with 8 sts in the first 11 rows, 7 in the 12th, 6 in the 13th, 5 in the 14th, 4 in the 15th and 3 in the 16th). 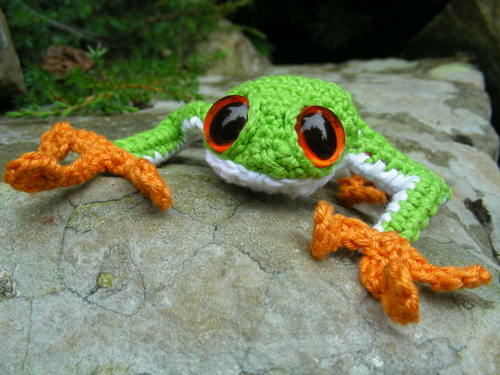 • Crochet all around the frog’s body to neaten the edge and give a slightly domed shape. • In orange chain 7 and single crochet in the remaining 6 sts. • Repeat this again, chaining down 7 and crocheting back for the 6 stitches, twice more, to make 3 toes, and knot the two lengths of yarn to pull together the foot. • In orange chain 6 and single crochet in the remaining 5 sts. • Repeat this again (as with the back feet) to make 3 toes, drawing together and knotting the yarn to form the foot. • In orange make a 7 stitch circle using a magic circle, close with a slip st.
• Weave in all the loose ends and sew a sucker onto the end of each toe. (I found using a regular needle and thread made the best effect). • Stitch the back feet to the back legs, and the front feet to the front legs; again, I’d use regular needle and thread, rather than yarn. • Sew the green head to the green body, matching the back of the head to the bigger end of the body.